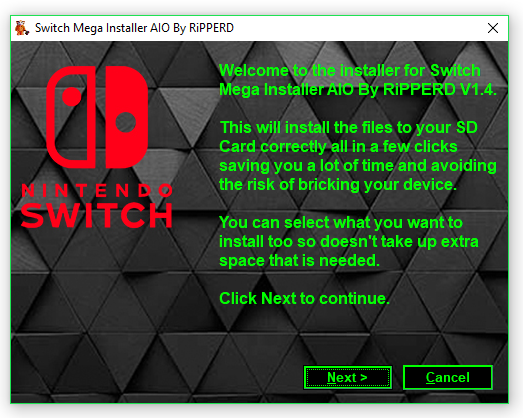 So this is my first release for the Switch, It's basically a remake of my Wii Mega Installer. It contains all available apps for the switch, cfw files and hacks, the main used apps by switch users. This app is good for those new to switch hacking / those wanting to save time and also those who just want to add extra apps to their SD Card. First time hackers all the files you need for this are on here. Those who want to change firmware without conflicting files or formatting sd card. Those who formatted cards and want to customise their firmware. What this app does is installs all the needed/chosen files to your sd card. Atmosphere CFW, ReiNX CFW & Now SXOS! Few i missed but your see them in the list. If you want your homebrew app/game added to the installer let me know and ill add it to next version. You can add your own files to the sd card after if required but this includes most available apps for the switch. If you are a Dev and you want your app added to the mega installer then drop me a PM and ill get it added to the list. I'm surprised you still haven't done that. Switch scene has so many goodies and interesting developments! My wife bought to me the Christmas after release date, it is on highest firmware though. 1.) I am worried i will brick it. 2.) I am worried about getting banned from online. 3.) I am a coward and it takes me ages to use a hack when i have decided that is what i want to do, i think it took me a month of talking to people before i did my Wii, i don't know, i just think i worry more about something i really like when chances are high that it could brick.